04 - Arcata to Blue Lake to Korbel. Handwritten land holding exchanges - probably SBF handwritting. 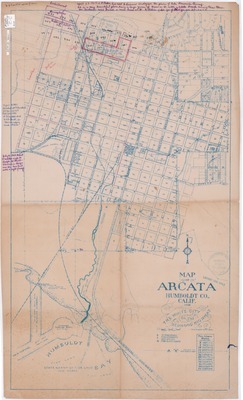 ; Arcata, tracts and additions, block numbers, schools, companies, state monuments, fire hydrants, gate valves, fire alarm boxes, land owners.